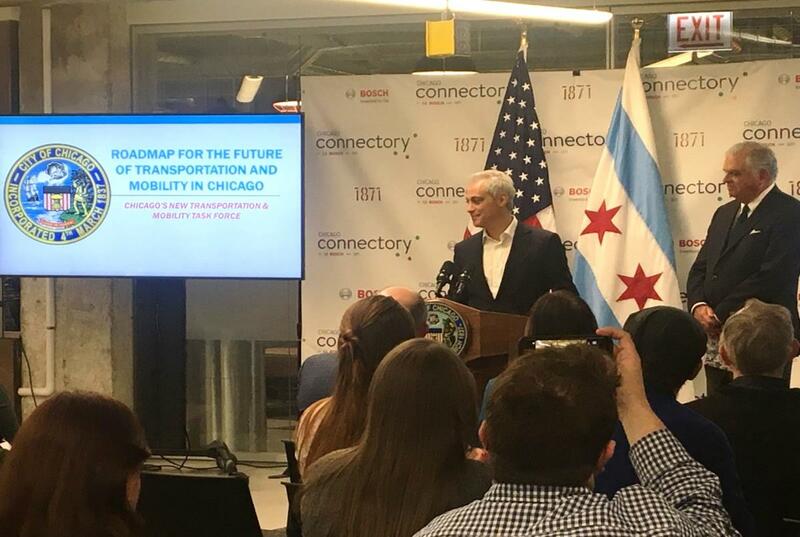 On March 14, the Chicago Connectory welcomed back Mayor Rahm Emanuel for the second time this year, to present a progressive and innovative roadmap for the future of mobility and transportation in the city of Chicago. The future-looking roadmap includes the New Transportation and Mobility Task Force created by Mayor Emanuel back in September 2018. The event started with Chairman of the Task Force, former US Department of Transportation Secretary Ray LaHood, speaking about the importance of the Task Force and its purpose in Chicago. Later, he introduced Mayor Emanuel who provided further details of the Task Force. The Task Force has 20 experts and leaders from government, business, research institutions, neighborhood and civic organizations, and not-for-profits in the transportation, mobility and technology sectors. In the last 6 months, the Task Force researched and gathered information from over 40 industry experts to support their vision on Chicago’s transportation system. This process allowed the Task Force to take current challenges within Chicago’s transportation system into consideration when developing their roadmap for Chicago. Below are the principles set by the Task Force, from which seven interdependent recommendations to support the transportation system were developed.